The signs are pretty clear: Complaints that cooking is too much trouble and dishes piled up in the sink. Housework left undone. Forgetting when to take medicine. Expressions of loneliness or fear in being alone in the home. These signs all point to it being time for seniors to possibly make the move to an Assisted Living Community like Regency. It’s normal for aging parents to be in denial about the realities and dangers of staying at home. After all, they may have worked and saved for decades to have a home for the family, but there comes a time when downsizing and moving to a modern Assisted Living center may be in their best interest. Family caregivers may be overwhelmed or the senior left bored with only a television and the occasional visitor from church to keep them company. Approach it as a discussion of options to make life easier, more fun even, rather than a decision that’s already been made without consulting them. 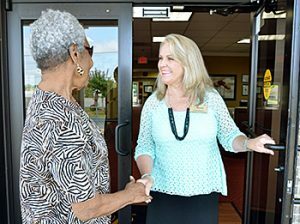 Tour some local Assisted Living communities so the senior feels as if he or she has a choice in the matter (as they should). Ask the residents how they feel about living there. Check out the scheduled activities. Determine whether the senior may have friends he or she never sees anymore who are already living there. Show interest and excitement. It can be infectious and cause the senior to adjust attitude if he or she feels that moving isn’t such a bad thing after all. Talk about how you’d envy them not having to do yardwork or call a repairman to fix something in a home. Reflect on how much better it will be to move into such a community before he or she HAS to because of a fall or other accident. In many cases, this is the impetus for such a move, and it is far less pleasant to relocate while recovering from an injury as well. When touring, ask to see all of the safety features of the Assisted Living community, stressing to the parent that these amenities will provide peace of mind for the whole family. Telling them that you worry about them is telling the truth. At Regency, our apartments are just like any, except that help and social opportunities are never far away. Stress that the community respect privacy and dignity but also wants residents to feel included in social activities if they want to have company. Stress that at Regency, residents are able to decorate the way they want, so they do not have to discard a lifetime of possessions. It’s important for family to be sensitive to how difficult this change can feel with so many sentimental attachments to things and places. Senior parents tend to not want to burden family with their needs. With Assisted Living, they can get rides to the doctor’s office so they do not miss appointments. This frees them to enjoy more quality time spent with family rather than feeling obligated to give rides. If the parent is still reluctant, a family friend or pastor might visit and discuss it. They can often frame the discussion in a way that does not seem threatening and cause the senior to reconsider. We hope this information is helpful when you recognize the signs that it is time to make a change and start an exciting new chapter in a senior’s life.